Julie Fergus, ASID | NH Interior Designer: Dated Finishes Need to Go! Dated Finishes Need to Go! Why do you live with dated finishes and decor? If it is for budget reasons then the easiest way to improve the look of dated finishes is with paint. Stained pine trim is basic and can be dull. A fresh coat of white or off-white paint will instantly improve the look and feel of the space. In this example, there is a beautiful view. The stained trim distracted the eye from looking through the windows. 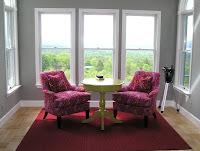 Once the trim was painted the space was visually simplified to allow the view to stand out. This is just one of many ways to improve the style of a space.